In response to our last trip report, we received volumes of supportive e-mails from around the world from nice folks who have bumped into our web site one way or another. Everyone is genuinely enjoying our trip logs and we are excited to have several hundred “virtual cruisers” along with us on Indigo Moon. Welcome! What’s going on in the “Day-in–the-Life of Boat Bums in Paradise” today, you ask? It’s raining this morning in Hope Town, so we stayed in our bunk and watched William Wyler’s film "Roman Holiday." Audrey Hepburn is as mesmerizing as ever in that 1953 film that absolutely sparkled with the innocence of the early fifties. There is a great “Special Features” section on that DVD too. It includes footage of Hepburn’s screen test where they intentionally left the camera rolling after the test (without Hepburn knowing) to see what her demeanor was like when not so nervous (this was her first major film and she understandably had the jitters). It’s nice to take time to really appreciate films, along with all the segments that are now included on DVD’s. In case you haven’t noticed, we love movies. We don’t miss network television in the least, and we would much rather watch movies and read. In the last week, between movies, we’ve been reading various books on subjects about diving, sharks, and the history of the Bahamas and the Abacos. It seems to me that the cold fronts should stop making their way this far south and east pretty soon, though, and then the inside “movie days” will be less frequent, being replaced by books and music out on deck while sailing to new destinations. 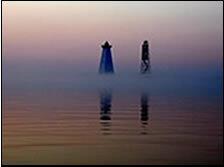 This morning, and every morning at 8:15 a.m., we listen to the “Cruiser’s Net” on VHF channel 68. 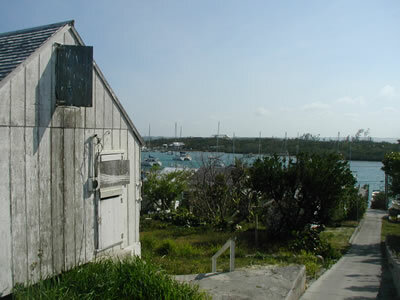 The Cruiser’s Net is a 365 day per year broadcast out of Marsh Harbor founded over fourteen years ago here in the Abacos. The show includes news, weather, community announcements, and “open mic” where cruisers ask questions and seek help regarding mechanical trouble, health issues and everything in between. 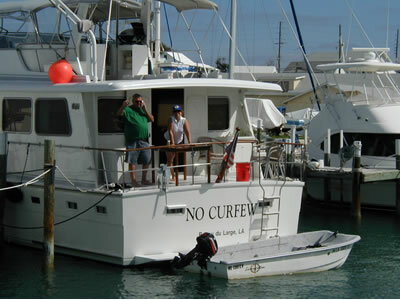 On the Cruiser’s Net this morning we learned that a couple went diving off their boat and left it unattended tied to a mooring provided at the Fowl Cay Nature Preserve. The mooring line broke while they were diving and their boat drifted away. A local dive company, Dive Guana, was on a dive trip at Fowl Cay too and just happened to spot the divers, sans boat, and picked them up. They caught up with their drifting boat THREE MILES out in the Atlantic. This incident was of particular interest to us (as you will see later on in this edition). 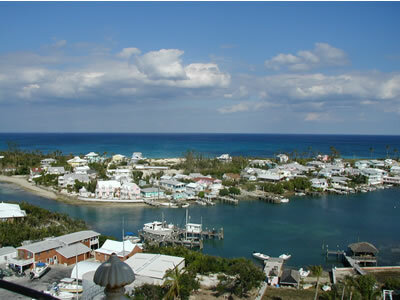 In this report, we feature destinations in the southern part of the beautiful Sea of Abaco. So -- you there, on the starboard bow -- if you would be so kind -- as soon as you are ready, please un-cleat that bow line next to you and give us a good push off the dock so we can get underway! 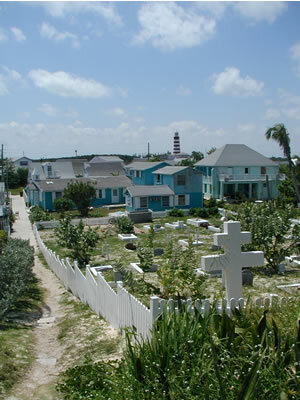 Hope Town is located on Elbow Cay and is touted by many as the most picturesque settlement in the Bahamas. 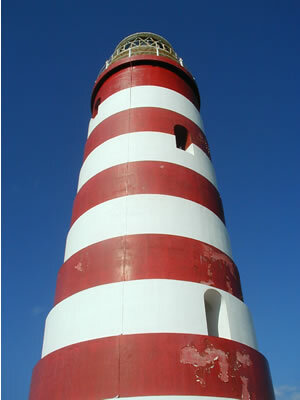 The most notable feature of Hope Town is the much-photographed lighthouse that was built by the British Imperial Lighthouse Service in 1864. 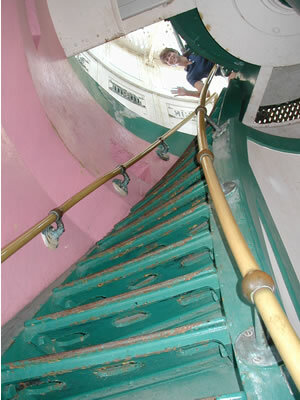 Inside, sections of steel, spiral staircase lead up to the top. 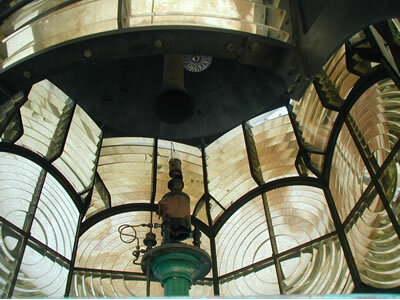 Large Freznel Lenses turn and magnify light emanating from a small kerosene-burning mantle (the size of a boiled egg) into 325,000 candle power concentrated beams of light that can be seen for 17 miles! I stuck the camera up through the machinery and held it out at arm's length to get this shot. The machinery of the light is antique and bathes luxuriously in 3-in-One Oil to fend off the salt environment and corrosion. Elbow Reef Lighthouse is one of the few lighthouses in the world to escape automation and it is still hand-wound and kerosene-burning. 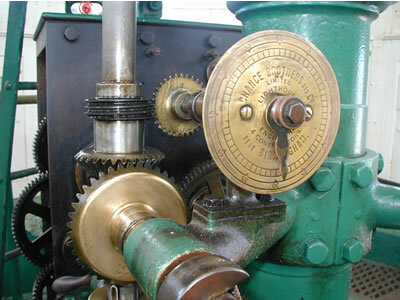 It's quite interesting to examine this fine machinery -- one more proof that "they don't make anything like they used to!" Melissa waves down from the top of the lighthouse. Hold on good! Northeast view from the top of the lighthouse: to the left, the entrance to Hope Town Harbor and the Atlantic beyond Hope Town. Southeast view from the top of the lighthouse: Hope Town Harbor, Elbow Cay, and the Atlantic beyond Hope Town -- those brown patches in the green water close to shore in the Atlantic are coral heads and reefs -- lobster and grouper are out there right now! 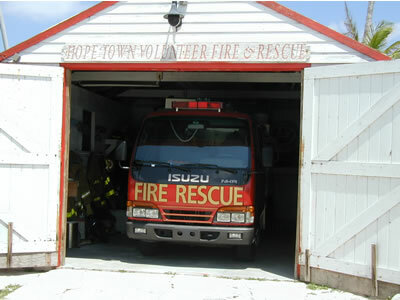 Hope Town was founded in 1785 by British Loyalists who were fleeing the American Revolution. 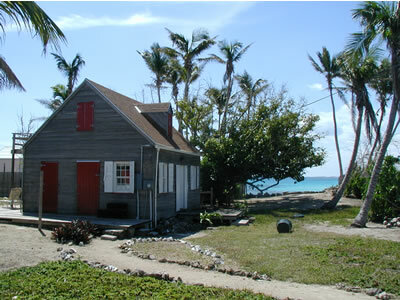 The lighthouse at Hope Town was not built until 1864, seventy-nine years later. I met a local here who told me that his direct ancestors are British Loyalists who came over from the Carolinas in the late 1700’s as part of the original founding of Hope Town. According to him, the construction of the lighthouse was impeded by the locals who cut off supplies and did everything imaginable to halt construction. Why? Well, originally piracy was rampant and very profitable in the Bahamas. There are countless reefs upon which to easily trap vessels. 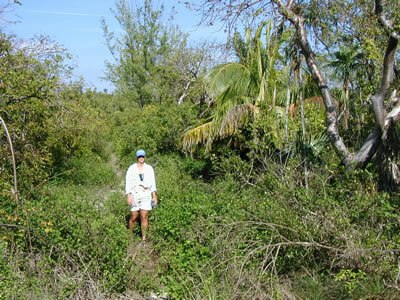 Also, there are many hard to navigate channels leading to coves behind Cays. Pirates successfully hid out of reach behind treacherous reefs after a plunder. But, in 1717 the pirate trade was adversely impacted when many pirates operating in the area were finally caught and hung. 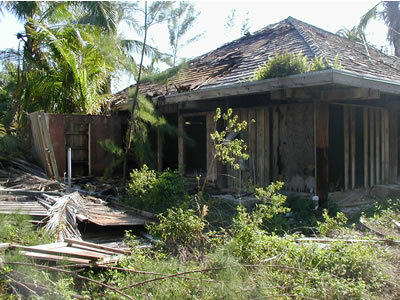 Thereafter, with piracy no longer an occupation without heavy risks, Bahamians in the Abacos took up salvage and wrecking as the major trade of the post-pirate era. As per Shakespeare’s quote from Macbeth: “Blow wind, come wrack,” and the trade of “wracking” was doing well in the post-pirate era. Shipping had increased and numerous vessels still met their demise, without the pressure of pirates, on the very shallow and wicked reefs in the Bahamas. The most important ingredient in a steady stream of wrecks: a total absence of any aids to navigation. As such, the lighthouse was a direct threat to the wrackers' livelihoods and its construction was vehemently opposed by local Abaconians. 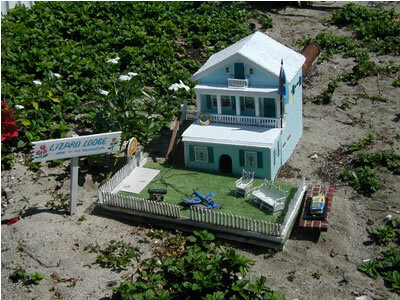 In fact, once the lighthouse was completed, I am told that several families of wrackers took their houses apart, stick by stick, shipped the houses to Key West and reassembled them there, where the wracking and salvage business was still viable. 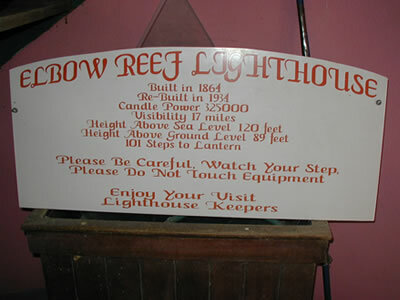 Thus, the Elbow Reef Lighthouse was very controversial from the start, and deadly too! 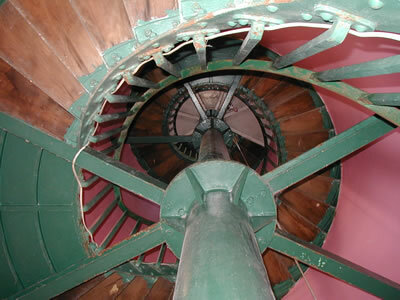 In 1920, a lighthouse keeper fell to his death while conversing with another person down on the ground below, who reported seeing the fall and described it as what looked like "a bundle of rags falling from above." Three decades later, in 1951 yet another lighthouse keeper “fell” to his death. Horrid gossip consequently percolated around alleged adultery and alcohol abuse. These islands, though spectacularly beautiful, are extremely rugged. It is apparent that for centuries the Abaconians have been a tough bunch of folks who managed to overcome very harsh sea elements here and survive, sometimes only at the subsistence level for generations. 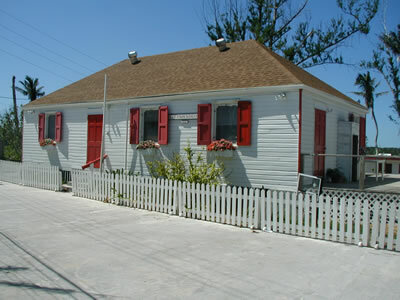 Today, Elbow Cay and Hope Town operate as one big resort with super-high priced real estate comprised of very quaint cottages and small houses in town and sprawling ocean front estates south of Hope Town, all of which are rented out to vacationers at reasonable rates. 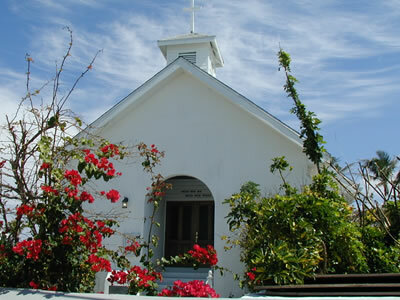 The Methodist Church. The bell tower provides chimes of various hymns both at noon and at six o’clock p.m. -- It reminds me of little New Roads, Louisiana, where I grew up -- they blew the town emergency siren everyday at noon -- small towns have time signals. 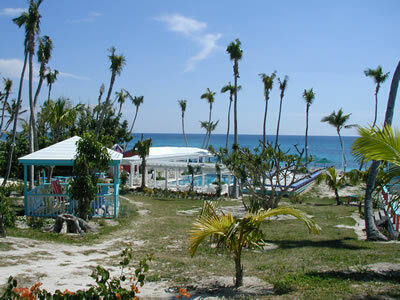 Hope Town Harbor Lodge’s pool and bar/grill on the Atlantic beach. 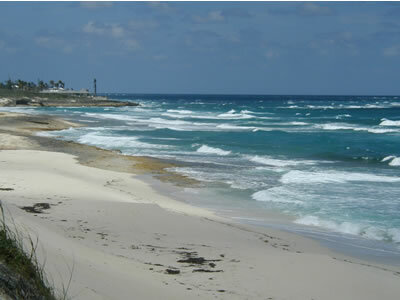 Bring your snorkel gear and have lunch and enjoy the reefs fifty yard off the beach! A harsh environment renders contrast and rustic beauty. A look back into town as viewed from atop a sand dune at the beach. 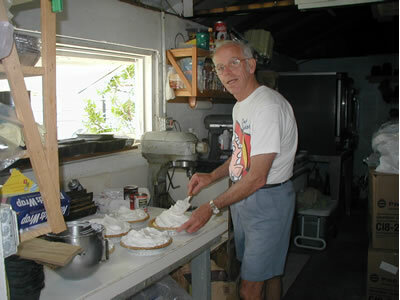 Here he is: Vernon in his kitchen finishing a batch of his famous Key Lime Pies! Vernon is also the local Justice of the Peace and he was just featured in a Freeport newspaper article for performing his 500th wedding ceremony. He has performed ceremonies for various celebrities and rock stars, including Chad Smith, drummer of the rock group Red Hot Chili Peppers. 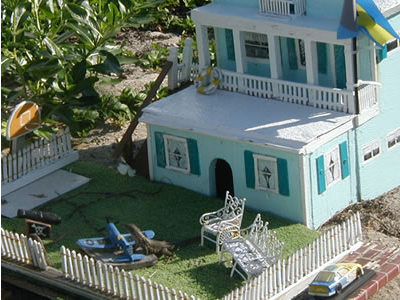 The “Lizard Lodge” scale model in the front yard of a cottage has been here for years and is a favorite of "kids of all ages" as they say. 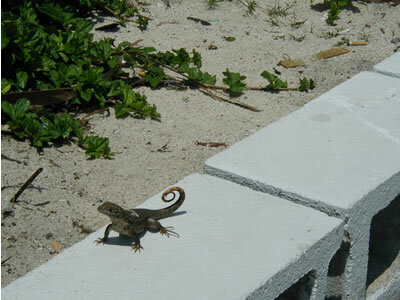 It is inhabited by "curley tail” lizards that have evolved such their tails don’t drag in the hot sand anymore. Looks like Mr. Curley Tail is thinking about an airplane ride today. 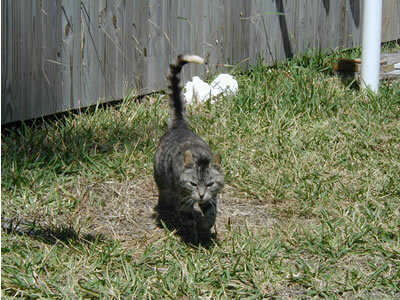 Here is a good shot of a Curley Tail out for a walkabout. Perimeter "lizard patrol" Cat! 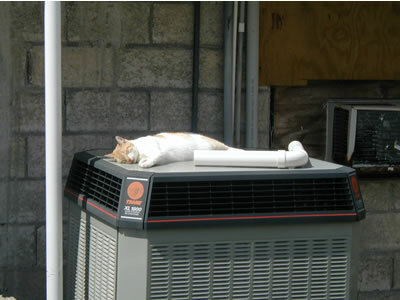 Cats have it made in Hope Town. 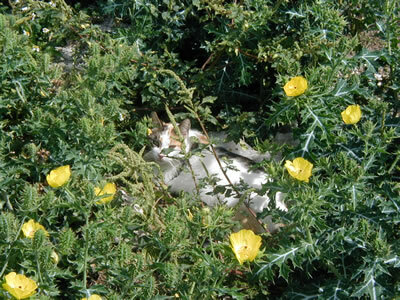 We are told, however, that now most every dog and cat on the island has been spayed or neutered after an organized community effort to do so. 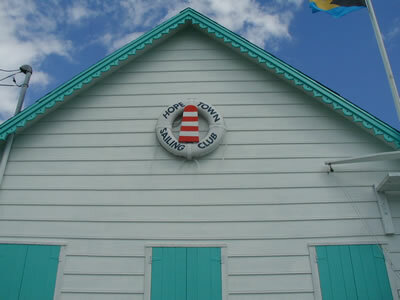 What else is dear in Hope Town? 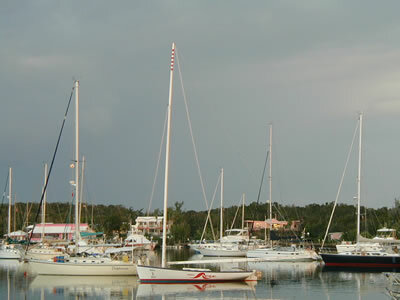 Abaco sailing dinghies! The locals pride themselves in the art of sailing these small, wooden hand-made dinghies and tout the Hope Town races as a must see event. Abaconians enjoy racing these famous wooden dinghies. 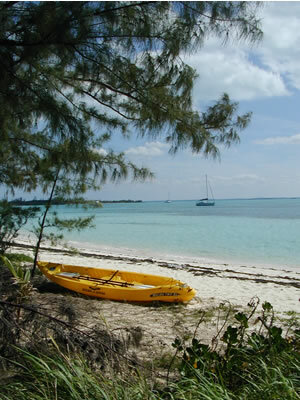 There is also a racing circuit in the Bahamas for BIG Abaco dinghies. A big race is coming up way down south in Georgetown. 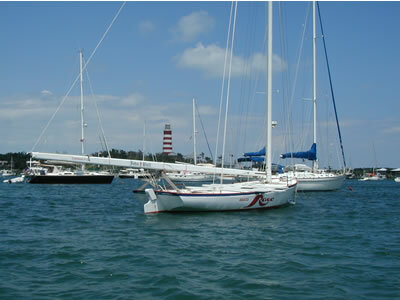 These racing dinghies are very large scale versions of the little Abaco dinghies. 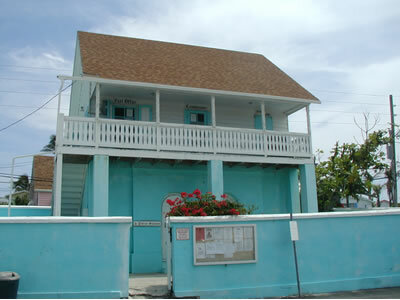 The “Abaco Rage” is Elbow Cay and Hope Town’s girl. 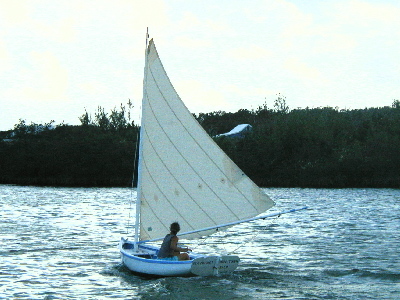 Abaco Rage - wooden racing sailboat. Note the top of the mast that is striped to match the lighthouse. 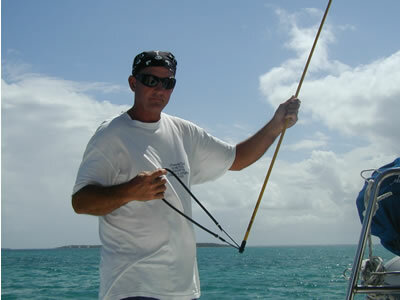 Abaco Rage: look at the length of that boom! The sailplan is one HUGE mainsail and the crew (up to eighteen) hikes out on boards to counter the leverage of the massive sail. 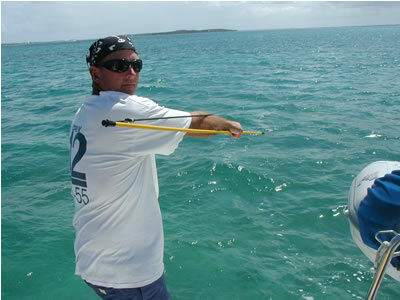 With a sail that big, and boom that long, jibing the Abaco Rage requires extreme teamwork and skill. I hear from the locals that the races are pretty rowdy and that the rules seem to change from Cay to Cay to favor the entry hailing from the particular site of any given race. For example, I was told that the crew of Abaco Rage added two feet to her keel and when word got out, the race course at another Cay was moved to shallow water that would cause Abaco Rage to run aground! There are great fishing boats here too. One that really caught my eye is a favorite make and model of mine: the amazingly well-designed and seakindly Bertram 31 that is, in my estimation, a perfect day-trip offshore blue-water fishing machine. 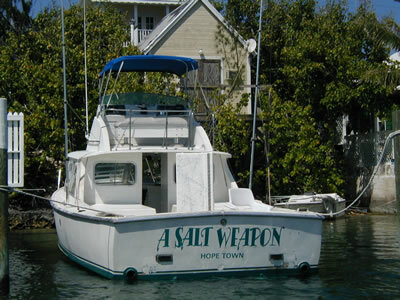 The name of this one is very cool and probably the best descriptive name imaginable for a Bertram 31: A Salt Weapon. There is no better craft upon which to spend a day "assaulting" blue water gamefish like marlin, tuna, wahoo, and mahi mahi! 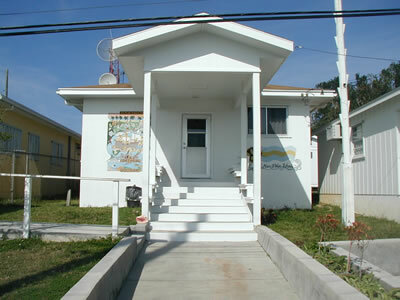 Hope Town’s government is seated in the Hope Town Government Building that houses the Police Station, Commissioner’s Office and Post Office. It looks refreshingly uncomplicated compared to the ten story Governmental Building in Baton Rouge, Louisiana, where I spent years practicing law on the four floors of various courtrooms! Governmental building. One stop shopping: offices above and jail below. Ok, so much for the Hope Town street scenes. What about the BEACH!!!!? Right? 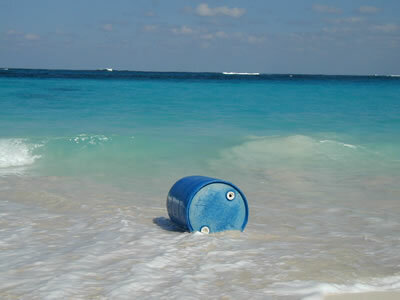 Well, the beach at Hope Town is "World Class." This simply cannot be real! We grin an awful lot and have to pinch ourselves now and then! Melissa loves to go for a walks, especially on a beach where the only footprints are ours! Look who started stalking Buddy! 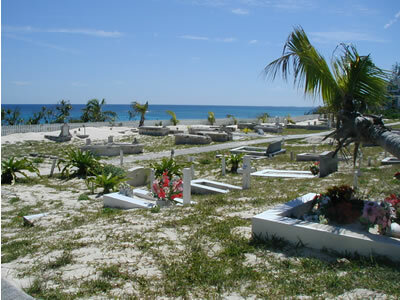 While on one of our strolls we came upon a seaside graveyard south of Hope Town proper. I have always found graveyards intriguing rather than creepy. I always wonder what those at rest were like. Were they Fun? Interesting? Happy? Friendly? -- or --Mean? Unhappy? Sad? Dishonest? How did they die? Were they "square" with life at the end, or did they depart with unfinished business? How does the world remember them? 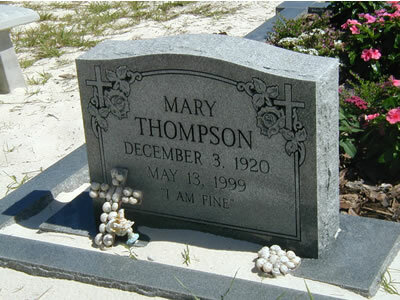 Here rests a pure optimist – I bet she was a neat lady! You see the name Albury everywhere here. So much so, you wonder if just one family founded the Bahamas. 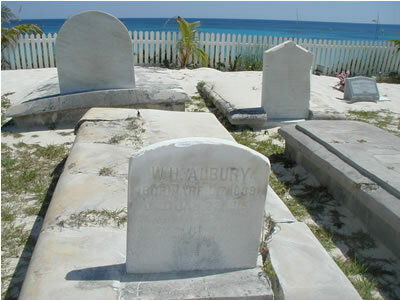 There are several old, 1800’s headstones for various members of the Albury family. 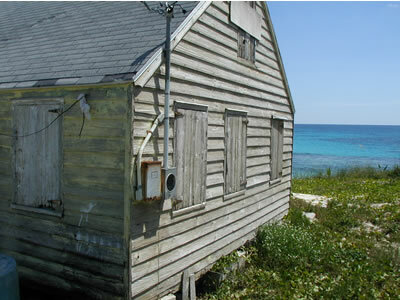 Just South of Hope Town: a place of rest and reflection by the sea. 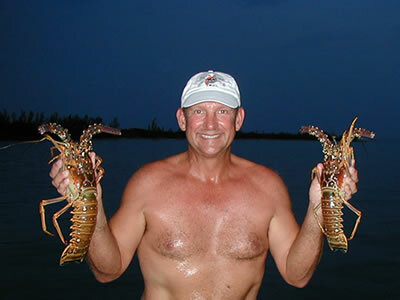 Also, while at Hope Town I tried my first shot at spearing lobster. To do this, I used a Hawaiian Sling, which is a "poor man’s" spear gun if you will. Real spear guns are illegal in the Bahamas as is the use of SCUBA gear to spearfish (unless you’re a Bahamian -- then you can do both). So, we have to snorkel and use the sling -- a big disadvantage that ensures the local fish markets stay busy. Now, mind you, we had never been spear fishing before coming to the Bahamas. Here is the "business end" of the spear: three prongs known as a "paralyzer" tip. You use the surgical rubber hose to launch the spear. Here it is "cocked "; the spear is released and the surgical hose is held onto so that the spear is not lost. Careful Buddy! Don't shoot the dinghy, fool !!! Ready to try the Hawaiian Sling for the first time, we took the dinghy around the North end of Elbow Cay and went outside and down the shore out in the Atlantic on a calm day. Several hundred yards off the beach there are numerous large coral heads. I snorkeled while Melissa followed me in the dinghy. Finally, after searching for a couple of hours I was able to spot and spear a pretty nice little lobster. I had a few games of hide and seek with Nassau Groupers too, but they were wary and hid deep in the coral when I approached. The most I could do was lightly tap one's gill plates with a desperation shot. Nonetheless, we were glad we didn’t get “skunked” on our first time out. 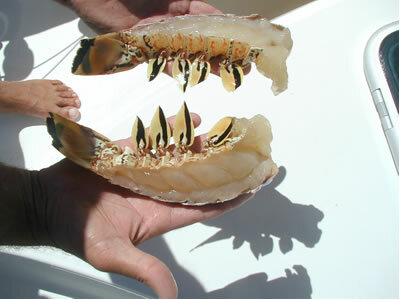 Very colorful creatures, the Bahamian lobster (called crawfish) have tasty meat. We whipped up a well-simmered sauce of olive oil, browned garlic, crushed red pepper flakes, diced tomatoes, and rosemary to which lobster chunks, seasoned with Tony Chachere’s seasoning, were added to steam for only three and one half minutes. We poured the sauce and lobster over angel hair pasta and had a delicious lobster dinner! 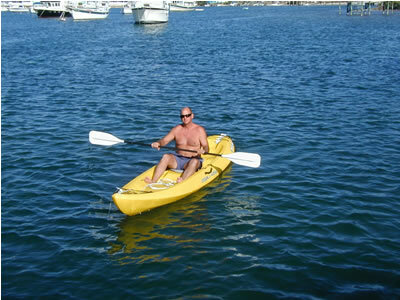 Also, while at Hope Town we christened Melissa’s kayak as Kiki and took her for a spin for the first time. The water had been a little cold prior to this, and we didn’t want to risk turning over until Hope Town. 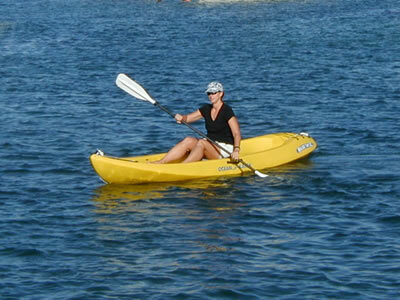 The kayak rides great with both of us and we have enjoyed several evening cruises on calm days, paddling silently in the crystal clear shallows as the sun sets. We take turns trying out the kayak which is actually built for two and does a great job. On yet another perfect day, Melissa and I took our folding bikes to shore and rode out of Hope Town to the south and rode all the way to the end of Elbow Cay where Tahiti beach is located. The wind was really strong, blowing on shore and the surf was really stirred up. The wind was really stirring up the surf. 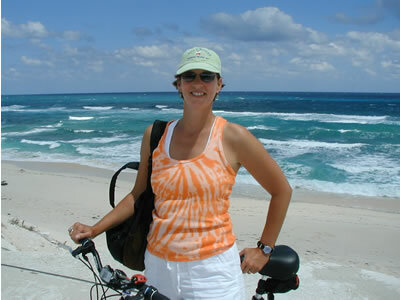 Melissa loves to ride her bike and says this was one of her favorite days. 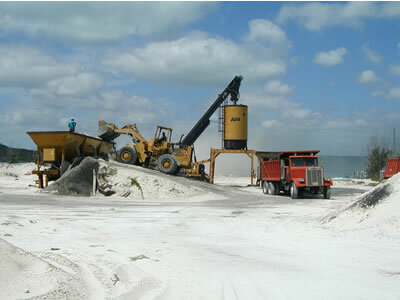 We came upon a “drum mix” asphalt plant running --- they were re-paving some of the island. I explained this contraption to Melissa, having sold such equipment in the late 70’s and early 80’s. Here is Tahiti Beach. It was originally named “Creek Spit” – considering no one wants to wade in spit, it’s no wonder they renamed it for tourism! 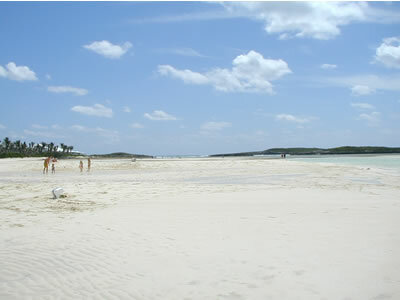 Actually a sandbar on the southern tip of Elbow Cay, tourists love to walk on the sandbar at low tide to hunt for starfish and sand dollars. We rode our bikes about eight miles that day and had a great time. While on the southern end of Elbow Cay, we stopped for lunch at the Sea Spray Resort & Marina at White Sound where we were served the best blackened grouper sandwich either one of us had ever eaten! But everyday isn't paradise. 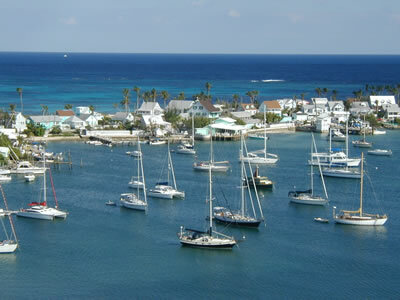 A few days ago we experienced friction in Hope Town harbor. One morning, as we sat aboard Indigo Moon on her mooring, a 38 foot monohull, sloop-rig sailboat drug her anchor slowly toward us in twenty-plus knot winds. By mid-afternoon, she had drug three boat lengths toward us and got close enough such that we were in her swing circle. The skipper was laid back in the cockpit and looking right at us from behind his Foster Grants, seemingly unconcerned as he continued to down KALIK longnecks (local Bahamian beer). His response, with an affect that unmistakably conveyed I was equivalent to a piece of gum he needed to scrape off his shoe: “I’ll keep an eye on it”, as he looked away mid-sentence and raised his KALIK (the fine print upon which I could now read) and took another slow swig, all with his legs propped up in the cockpit. Gee, folks -- I don’t know why, but actor Joe Pesci (in one of his violent "wise guy" rolls) flashed through my mind as a role model in that situation! So much for “no cross words with the world.” I was thinking more along the lines of “what would Martin Scorcese direct I do to this creep if this was a scene in Goodfellas?!" Despite my less than Zen-like internal reaction, however, my outward response was in keeping with the Zen state described in our last report. I said no more and quietly got in the dinghy. I went and talked to a few locals about what to do and they took care of it. Three things gleaned: 1) complete jerks find Paradise too; 2) we will keep our eyes peeled for the ugly sloop and be ready to protect ourselves; and, 3) I must be wary and ready to protect my goal of “no cross words with the world”, because even in Paradise an occasional tentacle of discord will surely intrude. And so it goes: progress not perfection. I can live with that. 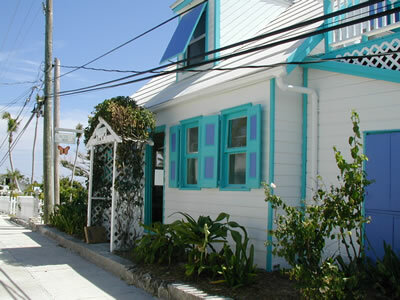 We are still enjoying Hope Town and using it as our home base for the month of April. We leave the harbor to run the watermaker in the Sea of Abaco to fill our tanks with fresh water from a clean seawater source. When the weather is nice, we anchor out in different places, away from the crowds found in harbors and enjoy the privacy of remote Cays. It’s also nice to just go sailing for the day with no particular destination. Of course, we still do quite a bit of work keeping up Indigo Moon. The other day I installed a new 12 volt cigarette lighter outlet at the helm to power a spotlight. I also created a nice lamp out of a basket from Pier 1 to hang over the cockpit table at night and it can be plugged into the new 12 volt socket too. Soon, we will create a section on this site called "Nuts & Bolts" to inform those of you who are interested in the upkeep and improvements that are extensive and forever ongoing on any well-maintained cruising sailboat. We get lots of e mail wanting more in-depth information on that subject. When we need parts and major provisions, we go to Marsh Harbor and anchor out overnight to go shopping. By the time April ends we will have fallen into a routine that mandates moving on! If we don’t, we can wind up getting too comfortable and never leave. Many Americans here did just that. Chris Prewitt, of Abaco Yacht Charters, told me he came here on his boat just to pass through over fifteen years ago, bought some real estate cheap, and never left – not a bad fate for sure. From the previous trip log, you should already be familiar with Great Guana Cay, where Nippers is located and the Barefoot Man concert that was held in March. 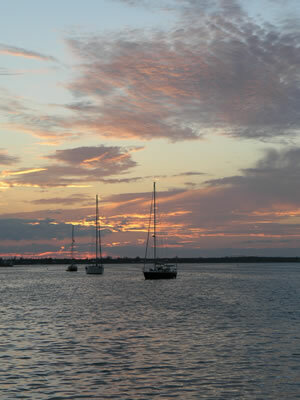 We went back to Orchid Bay Marina on Guana Cay to visit with our new friends, Capt. Richard and Mary Beth Johnson. We met them briefly after the Barefoot Man concert. 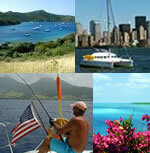 Richard is the captain of the spectacular 118 foot motoryacht Rebecca that is owned by Baton Rougean Alvin Kimball. 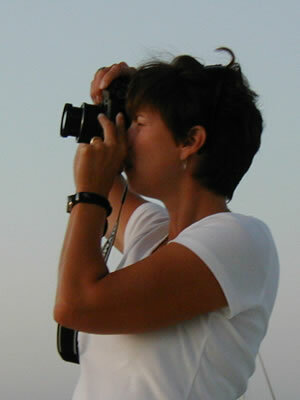 Richard's wife, Mary Beth, is the chef aboard Rebecca and she has been recognized in various publications as a gifted master chef. As such, this husband and wife team manage the Rebecca. We were fortunate enough to become friends, and Richard and Mary Beth also introduced us to Michael Roberts, the owner of Nippers. Michael and his wife, Jackie, took us all out to dinner at the Blue Water Grill one evening and we had a very nice time. Also, Richard was kind enough to spend a couple of hours going over my charts of the Bahamas to show me some really special areas that he recommended we visit. Then, he and Mary Beth took us on a tour of the Orchid Bay Development that will be a residential development with million dollar lots! 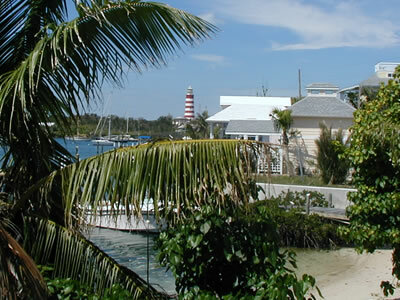 Guana Cay is "hot" real estate right now. We particularly enjoyed our visits with Richard and Mary Beth. They are very special and talented folks! 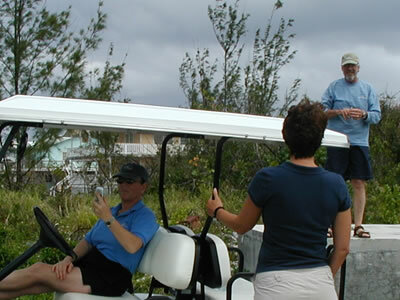 Mary Beth and Richard take us on a tour of the island in their golf cart. After spending a couple of days visiting Richard and Mary Beth at Orchid Bay Marina, the weather laid down nicely and we decided to head to the undeveloped part of north Guana Cay and anchor out for a few days. 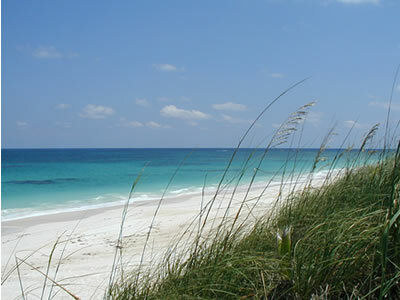 At the far northwest end of Guana is Baker’s Bay, a large crescent-beached bay that is wide open to the west and southwest, but offers good protection from winds out of the northern and eastern quadrants. When the winds are right, it is a delightful place to be. Now, to get you further oriented, the north end of Guana Cay is just south and across from the southern end of dangerous Whale Cay. The Channel between them is called Loggerhead Channel, as already described in the last report as being a place where the sea state can be very rough and confused, and in Rage Sea conditions, down right deadly. Nonetheless, in 1989, Disney had a ship channel dug at Loggerhead Channel that comes into a small turning basin on the inside of the very northern tip of Guana Cay and adjacent to Baker’s Bay. It operated for a few years, but Disney finally had to abandon the venture, because on two separate occasions the Big Red Boat ran aground and all the passengers had to be flown out ($$$$$). It was an ill-conceived plan in the first place. Even an itty-bitty boat captain like me can see that the Channel is too small, and more particularly the turning basin at the inside end of the Channel is too small for a cruise ship. No margin for ANY error. 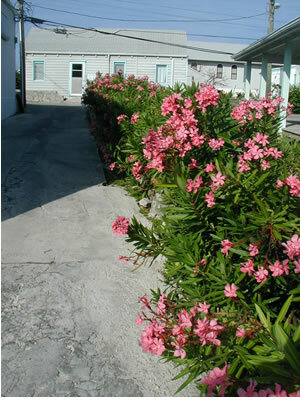 Compound that with the Channel being part of the the most treacherous, infamous Rage Sea area of the Abacos and you have to ask yourself: "what they were thinking!" After we got a chance to really explore the area, I understood Disney’s decision to try the venture. This area is so special, so beautiful, and so perfect that it was arguably worth the risk by Disney to see if it could be done. Plus, Disney has plenty of dough to experiment with, so why not? Kiki the kayak sits on the beach of Baker’s Bay with Indigo Moon anchored in the background in eight feet of water in Baker’s Bay. 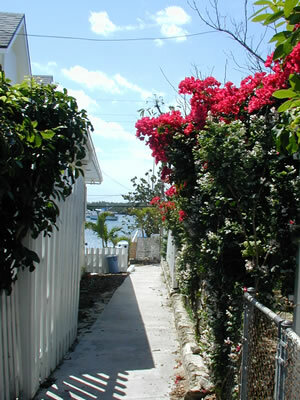 We found a trail at the south of Baker’s Bay through the narrowest part of the island to the beach on the Atlantic side. On the way, there is a tree that has all sorts of shoes hanging in it. We didn’t know why until we got to the beach. 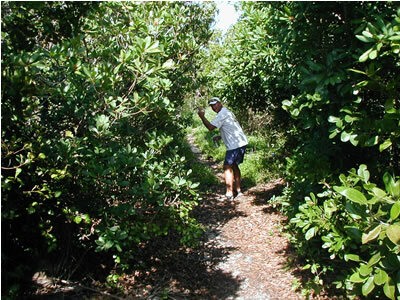 We make our way through the small scrub trees toward the beach. Once on top of the dune at the end of the trail, the Atlantic greets you! 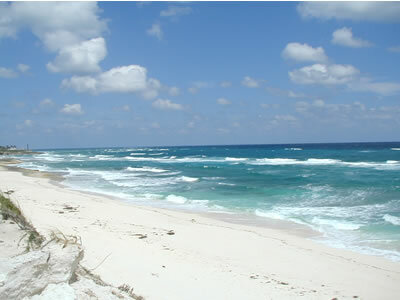 The beach is really nice, with high dunes toward shore and great expanses of beach. We walked toward the north end of the island to see how far we could get. 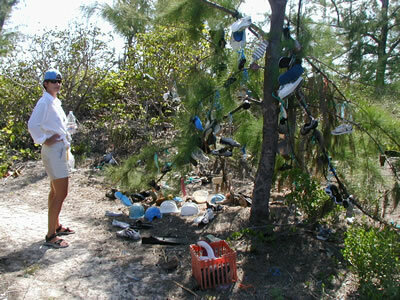 Any beach that is left unattended, especially after two hurricanes, will become a resting place for volumes of flotsam and jetsam from the ocean; thus, the explanation for the “shoe tree” on the trail in. Seems tennis shoes float real well and God only knows where all the shoes came from and by what currents. Apparently, somebody decided to carry some back on the trail and start the "shoe tree" and subsequent hikers have added to it. 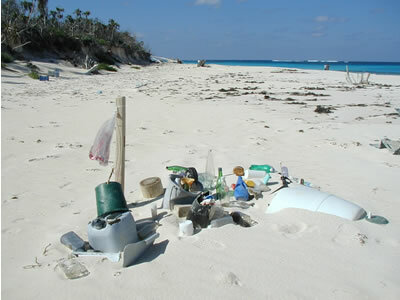 Also, previous strollers on the beach constructed the occasional “shrine of trash.” As part of “Coastal Awareness Month” here in the Bahamas this April, many volunteers got together and have since cleaned up the remote, northern beaches of Great Guana Cay. Oh, look Honey! More trash coming in just for us! 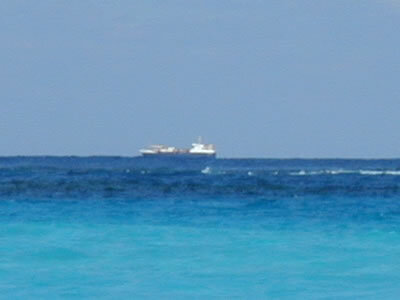 A container ship passes a few miles offshore – I think I see some shoes falling overboard! We walked and walked and walked and it was getting a little late in the afternoon. Just as we were deciding whether or not to just turn around and back track, we spotted an obviously large cut through all the trees. We decided to take the trail and guessed it to be the old “main drag” through the woods to the former Disney development on Baker’s Bay. We were correct. 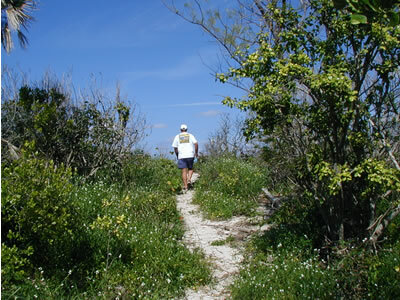 The trail is long and we walk for a good half hour through scrub trees and over small hills. 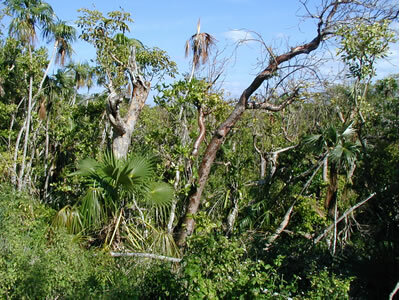 The trees include Gumbo Limbo trees also known as “tourist trees” (center, leaning to right) that have a red peeling bark, just like the sunburned skin of fair-haired tourists. 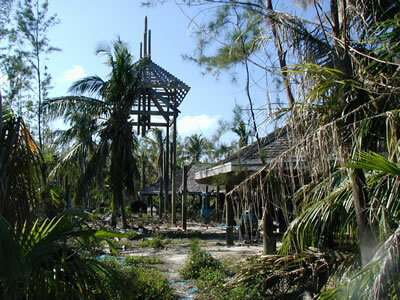 After a nice hike, we arrived at the ruins of Disney’s Treasure Island near the shore of Baker's Bay. We inspected what was left of the development. Workers were a few buildings away tearing structures down to make way for a new project that is planned. Even the the appliances had been abandoned by Disney! 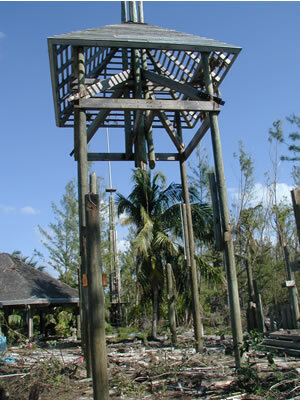 A "crows nest": Disney probably had actors in Pirate costumes swinging all over the joint. Gah-zee-bo will soon be "no mo"; Bye Bye! As we were walking through the long, covered pavilion, I was startled to see a man sitting in the shade whom I didn’t notice until we were right beside him. We talked to him a while as he worked on changing the blade of a power tool. He was in charge of demolition efforts and declared that the structures were built too well as he was having a hell of a time trying to dismantle them. 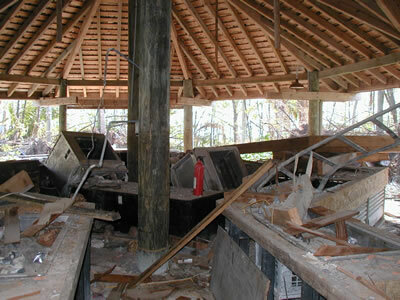 Plus, he was not getting paid except for the materials he was salvaging to take back to Hope Town for his own use. He went on to say that he had decided it was not so great a bargain. He was a nice guy and once he found out I was a “southern boy” he asked me what “Bubba” meant – someone had been calling him Bubba and he didn’t know if it was good or bad. We explained that it could be either, depending on context. After reviewing his case we ascertained that “Bubba” had been applied to him in an affectionate way. A full discussion of the use of “Bubba” is beyond the scope of anything we can cover here! But, let’s just say we put his mind at ease. After chatting with “Bubba” we went back out onto the beach at Baker’s Bay (which could be seen very pleasingly through the thin stand of trees between it and the Disney ruins where we were chatting). 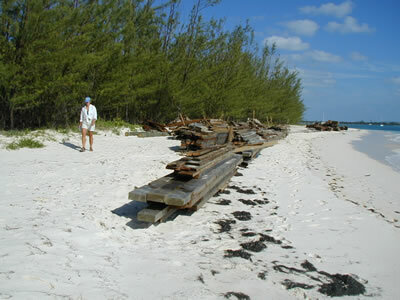 On the beach at Baker's Bay, Bubba had stacked over one hundred thousand board feet of very good lumber. Bubba gets some of the spoils from Disney in the form of good lumber. After our Disney expedition we walked south along Baker’s Bay, back down to where we had left Kiki, and paddled our way back to Indigo Moon. 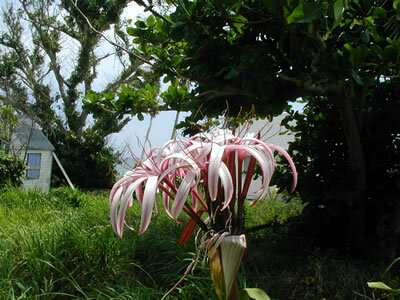 We enjoyed many new experiences at Baker’s Bay and stayed there quite a while. We like that there is plenty of room to anchor away from other boats and have privacy. Also, the water is very clear when the winds are calm and you can see the bottom perfectly. 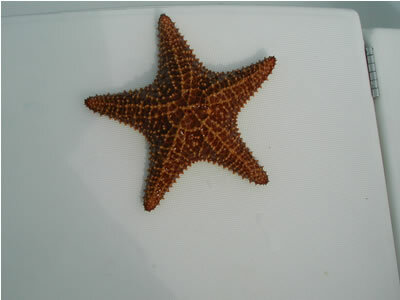 There are starfish everywhere in shades of yellow, orange, red, and brown. And it’s not just in the daytime that the bottom is visible. One night, I went out to make sure all was well (yes, I still do that a lot) and it was almost a full moon. The dinghy cast a very sharp shadow on the bottom only seven feet below. With the clear water not very noticeable, the dinghy almost looked like it was suspended in mid-air. Very cool. Anyone who knows Melissa, knows she loves to bake. While at Baker’s Bay, Melissa and I decided to, you guessed it, bake! We tried our hand at homemade bread. Our efforts produced bread, but that's about it. We have a long way to go before we are any threat to Cafe La-Florence! It seems there is a little more science to bread baking than we are accustomed to. Plus, our little oven isn't exactly what you would call a precision instrument. First, I was paying no attention to tides! Duh! If the water is shallower, the fish have less room to run. Second, wear a weight belt, Buddy! It takes way too much energy to dive down and stay down without plenty of weight to help. Third, go after smaller fish that are just as good to eat and easier to target (and it helps if you know which small ones are good to eat -- Jan gave me the "heads up" on that too). Fourth, look for structure that is complex with lots of openings, because the fish think they are under cover, but will eventually make a mistake and leave enough of themselves exposed to provide a target. Applying all this advice, I went with Jan and Cam to a place near Guana Cay and quickly had a “mess” of grunts (little cousins of the snapper) that rendered the sweetest meat imaginable. Lobster season ended March 31, so that’s the end of that for this year. 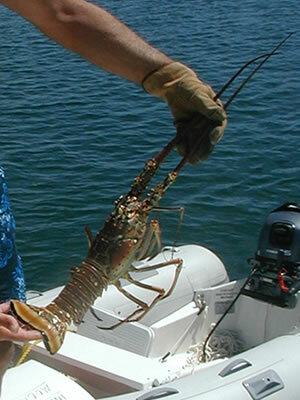 The penalties for spearing/catching lobsters out of season include jail time, fines and, most notable, the seizure of your vessel and all gear aboard while the Bahamians decide what to do with you. Needless to say, we won’t be doing any lobster hunting until the season opens again. We were lucky enough, though, to have more lobster before the end of the season. We didn’t spear the lobsters above. 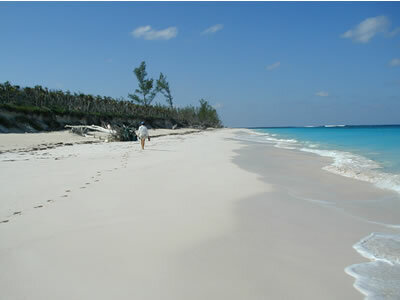 Just so happens we decided to walk all the way around the tip of Guana Cay one afternoon. 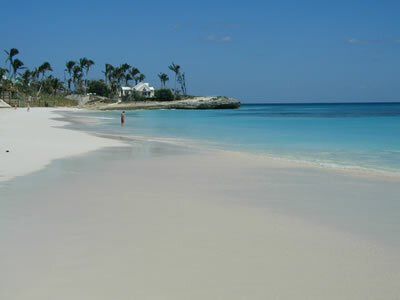 We started at the south end of Baker’s Bay, went north past the Disney debacle, and walked east around the tip of the Cay (about 3 miles to get that far) and then started down the miles of beach on the Atlantic. It was a most memorable experience. The water was flat calm with just the slightest, gentle swells that rolled over the various brown patches of coral, highlighting their locations. 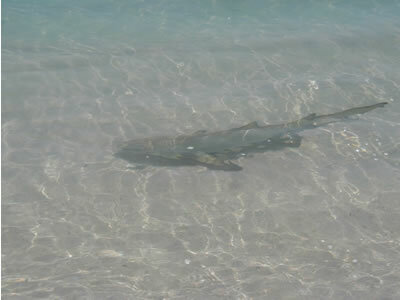 A five foot reef shark followed us along in the shallows. They really are like dogs. 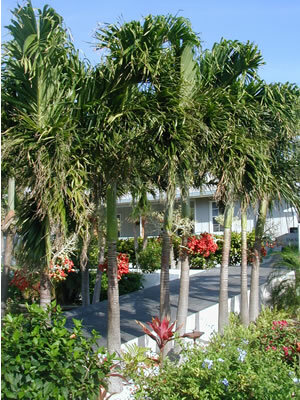 As we walked south, with high dunes and beautiful palms to the right and the ocean and reefs to the left, it was a perfect time. 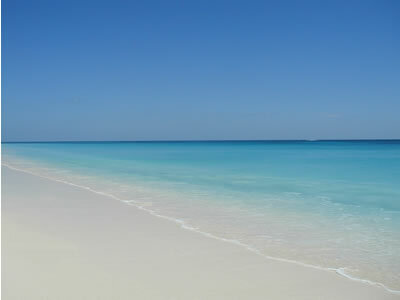 The sun angle, temperature, sea state and beach: all perfect. I wanted to own North Guana Cay in the worst way right then and can see why Disney tried to make a go of it no matter what the odds. Further down the beach, we came upon the four-man crew of Rebecca having a BBQ on the beach. Although Richard and Mary Beth were not with them, First Mate Tom and the three other men (brothers, polynesians and expert spearfishermen) were having a feast! They had been spear fishing all day, and through their efforts the four of them had eighteen lobsters and quite a mess of fish. They took pity on us. Tom waded out to Rebecca's big, twin outboard RIB inflatable tender (the deck of which was full of lobsters) and grabbed a couple of nice lobsters for us! What great guys. Another good size reef shark was keeping them company too, circling their tender and sometimes blocking the path for wading from the beach to the tender. One of the polynesian guys waded out, unafraid but wary, to the large RIB inflatable and beat loudly on the side of one of the inflatable tubes. That shark didn’t like the sound of that at all and bolted away – remember that, it may come in handy one day! We had a great time cutting up with the crew of Rebecca and finally had to start walking to get back to the Baker's Bay side of Guana before dark. The next day, Melissa and I took the dinghy and anchored it between large coral heads and snorkeled those same reefs off Guana. We snorkeled for a good hour and started back to the dinghy. I looked back now and then, and sure enough – a good size reef shark (about the same size and perhaps the same one fended off by the Rebecca crew) cruised up toward me and then veered off about ten feet away and cut between two coral heads behind us and kept going away. Maybe he noticed my big eyes and spear, both pointed right at him! Melissa had her back to me the whole time and didn’t find out until I told her in the dinghy. 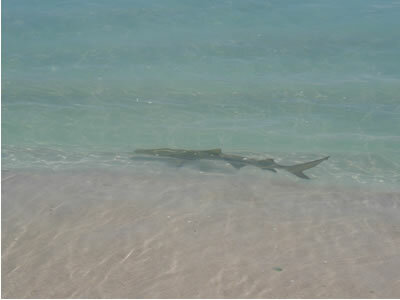 We have seen more sharks here in the Bahamas than anywhere we have been before. Accordingly, we carry the spear all the time. In the nature preserves, where spears are illegal, I carry a broom stick so I can at least try to hold off a shark if need be. 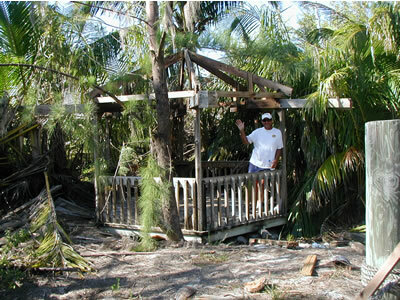 Guana was great, but finally we got “blown out” of Baker’s Bay when a bad thunderstorm came through on Easter weekend. The winds shifted and we were unprotected from two foot waves and 25 knot winds in the anchorage all day. We saw twenty other boats leave as the day progressed and finally we realized everybody had gone but us! I guess we loved it so much we were not willing to go, but Mother Nature insisted and we obeyed. 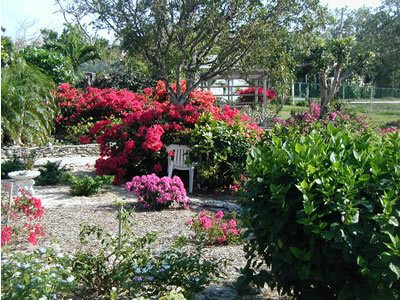 We hope to revisit that area with our guests at the end of April. 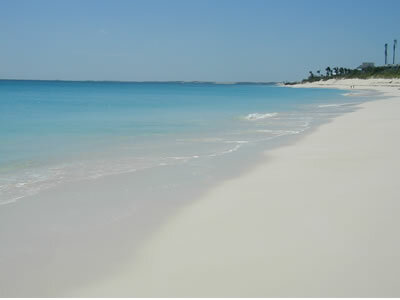 If the weather cooperates and Baker’s Bay is in its “magic state”, they are in for a real treat! As far as the beautiful north end of Guana Cay and Baker’s Bay is concerned, it is apparently irresistible to developers and a new project is underway: The Passerine Project. Four hundred million dollars is pledged by a private group to build a residential development with a marina comprised of 240 slips (no live aboard cruisers allowed). You must have a house or condo to keep your boat there. Plus, an eighteen-hole golf course is planned. As a jaded lawyer, I do not hold out much hope that the Passerine developers will be deterred. Most likely, they will probably "sell" Guana residents some “window dressing” at the hearing and then proceed. The old “Uncle Earl” routine, I call it. Infamous Louisiana Governor “Uncle Earl” Long used to, in an election year, promise most anything to both constituents and opponents alike by saying: “And that you shall have, or something better!” Thereafter, when it was time to "own up" to a prior promise, it was up to shrewd Uncle Earl to decide exactly what “something better” was. There is an old saying: When something big happens that makes absolutely no sense, you can bet that it’s about very big money. That might be Guana’s future. 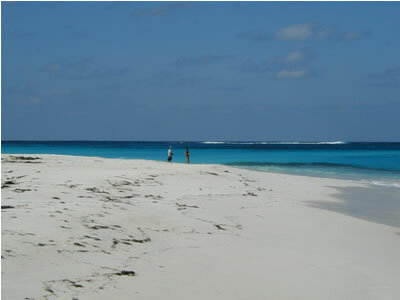 Thus, we are fearful that it is only a matter of time until the wild, wonderful north end of Guana and its amazing reefs are no more compared to what we enjoyed. Regardless, even if it is adequately preserved, the woods and trails will be gone and a “Poor Boy” like me will not even be able to visit in my itty bitty boat. Accordingly, we feel very lucky to have spent a week there that was truly, absolutely, and unequivocally PERFECT! 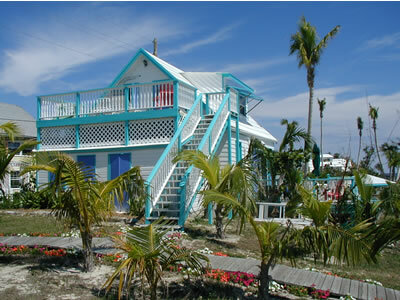 After thoroughly enjoying Great Guana Cay, we decided to stay a few nights at Man-O-War Cay. 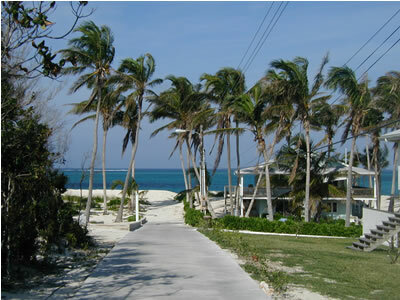 It is a small Cay with a personality all its own – more of a “working” settlement than a resort settlement. The Albury family pretty much owns it. They are boat builders and also own ten or so ferry boats that run between Marsh Harbor and the various out islands in this area. We found out how the marina gets fuel. 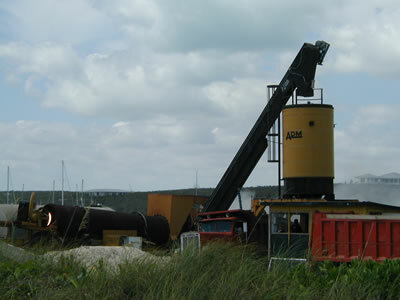 They drive an 18 wheeler gasoline tanker onto a barge and come over to the Cay with it. 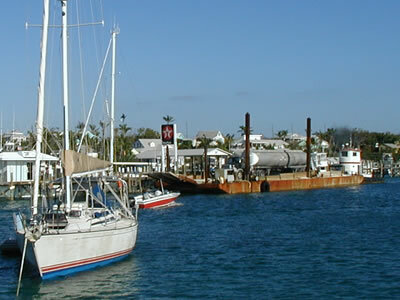 Tanker truck on a barge is how fuel is brought to the Cays. Watching the operation, I concluded that all things are possible when OSHA ain’t around! We met another set of Louisiana transplants. Jim and Nancy Clement of Broussard, Louisiana, spend six months of the year at Man-O-War Cay in the Abacos aboard their beautiful and spacious Choy Lee power yacht named “No Curfew.” We had a nice sunset visit aboard No Curfew, and a few nights later the Clements came to visit us on Indigo Moon. 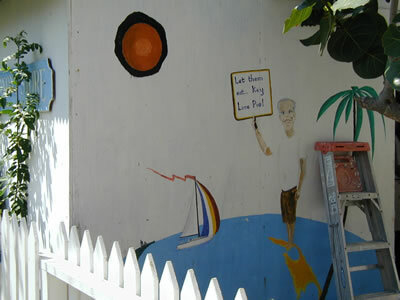 There are lots of shops and a good boat yard and hardware store on Man-O-War. 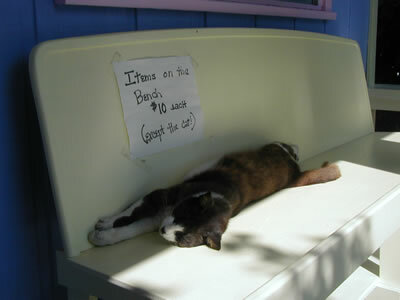 While walking one Sunday, we came across a shop with a cat that has to share his favorite bench with goods for sale during the week. The perpetual “everything goes except the cat” sale. That's Indigo Moon out in the harbor. 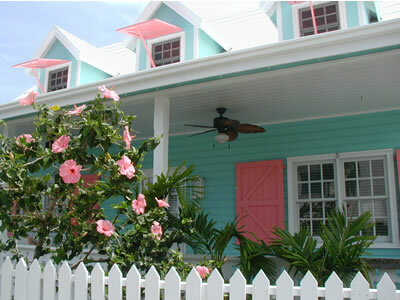 The name of this house? The sign says: "Costa Lotta." 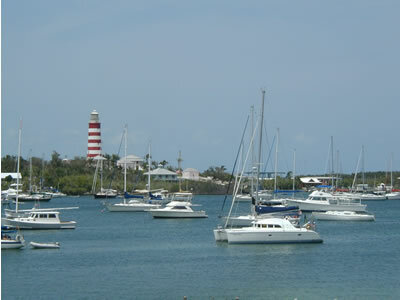 After leaving Man-O-War, we made an overnight stop at Marsh Harbor for provisions and then sailed to Hope Town to our rented mooring and “base of operations” for the month of April. Melissa and I probably take an equal number of pictures. Here she is in Marsh Harbour capturing a glorious sunset. And here is what she got. Last but not least, we enjoyed our first dive trip off Indigo Moon on the way to Hope Town. We went to Fowl Cay National Preserve. We tied Indigo Moon up to a mooring and dove in what was very shallow water -- only 25 feet. Some of our dives last year went to over 130 feet in the Blue Hole of Belize while visiting our friends Steve and Karen Adams, both of whom are expert divers. Diving is shallow in the Bahamas, though. 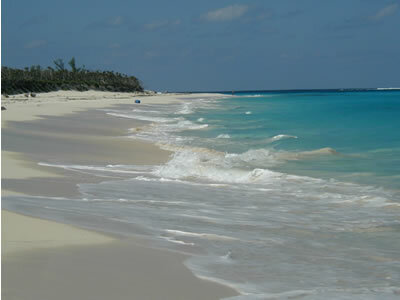 After all, "Baha Mar" from which Bahama is derived, means “shallow sea” and the reefs are at shallow depths here. Despite being shallow, it was a perfect first dive for us on Indigo Moon. We got to break out the gear and get used to diving off Indigo Moon. It was very easy and the steps down the back transoms of Indigo Moon work great. We jumped off the starboard transom, where there is no ladder in the way, and returned on the port transom’s ladder, hanging our tanks from the davits before climbing back aboard – it worked great! Yes, you guessed it. We dove at Fowl Cay, exactly where the other couple’s boat broke loose a week later and drifted out to sea as described at the beginning of this report. Yes, it could have been us!!! 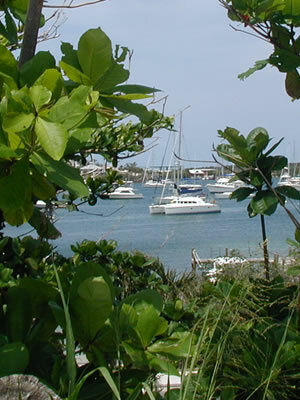 In fact, there are three moorings at Fowl Cay. 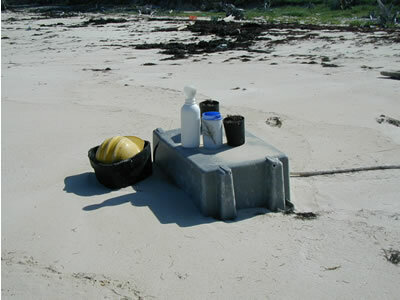 One is heavy duty, but it’s only 20 feet from the edge of the reef that is awash at low tide. DUH! It makes no sense because a big boat can’t use the big mooring or else swing into the reef and crash a rudder. The moorings farther out are not very sturdy. The smallish diameter of the line on the mooring concerned me. After we picked it up, I studied it for ten minutes as the boat worked it. Finally I made my own bridle because I just didn’t feel comfortable. I would bet my bottom dollar that is the mooring that broke loose on those folks! No, we will not try that again! From now on, if a mooring is not “industrial strength,” we will use our own ground tackle and anchor with lots of chain and then dinghy over. Also, it is imperative to choose days when the wind has laid down. It was ripping, up to 20 knots, the day the mooring broke and that couple almost lost their boat. Anyway, as Melissa and I were initially picking up the risky mooring, Melissa called out from the bow (as she snagged the mooring pendant with the boat hook and secured it): “Good God! What’s That! I went forward and we looked down at the biggest barracuda I have ever seen. His back looked like it was painted with shiny black lacquer and then clear-coated, and he was sharply visible against the shallow, white sand bottom. This thing was in the 70 pound range (they get as big as 80 pounds – world record is about 84 pounds, I think). Most “cudas” that we have seen while diving are in the 30 pound and under range. We are used to smaller ones staring at us. Seventy pounds is a bit much! Nonetheless we suited up for the dive. The transom steps were wide enough for both Melissa and me. We were ready simultaneously and I jumped in only a few seconds after she jumped in and gave me the AOK sign. As we deflated our BC’s and started our descent, we saw the big cuda a few feet away. He positioned himself exactly between the hulls, exactly amidships, and at exactly the same depth as the keels such that he looked exactly like a third, middle keel! He was even the same length as the keels! We just have to break down and get an underwater camera one of these days. It was a very cool sight to see. He stayed there, motionless, as we swam one hundred feet away to then circle a huge coral head with lots of neat ledges and tunnels near the bottom. When it came time to return to the boat, I must say that the huge cuda was very accommodating. Melissa got out first while I kept an eye on Mr. Cuda. He eased out from under Indigo Moon and out into the sun. He is obviously very familiar with this drill and knew that we would be cranking up the boat and leaving after the dive was over. We were glad that this big cuda was as “laid back” as the smaller ones we have become accustom to diving with. It was a nice dive and everything went smoothly – the most important part of “smoothly” for Melissa is that, for once, we didn’t see any sharks. Not unlike many people, Melissa has a fear sharks. Our friend Karen Adams tried to comfort Melissa one time by telling her sharks were not that bad and were nothing more than the equivalent of big dogs in the ocean. This was not much of a comfort to Melissa since she also has a fear of big dogs! Yikes! In an attempt to ease her fear of sharks, Melissa is working on being able to identify different sharks to know which species are a danger to divers, as well as learning what to do in case a shark is encountered. Most sharks only pose a threat to divers if molested or in the presence of bait. 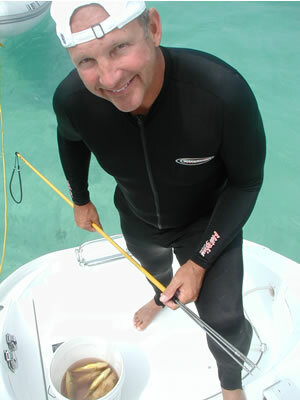 However, according to our acquaintance and fellow Baton Rougean, Clay Coleman, in his book The Certified Diver’s Handbook, there are four species of shark that have such bad reputations for aggression toward divers that you should be on maximum alert and abort the dive if one is sighted. So what are the four? Well, I'm sure all of you guessed that a Great White tops the list! The other three are the oceanic whitetip shark, tiger shark, and bull shark. Tigers and bulls can be found here in the Bahamas, but so far all we have seen are the little reef sharks that can be managed if you don't let one sneak up on you. If a shark is too interested, leave the water quickly and smoothly while keeping eye contact. All of our fresh-water-rinsed dive gear dries by hanging in the shade on the Bimini Top frame while Captain Melissa leaves Fowl Cay to our port side – if you are "way cool", one day you too can steer with your right foot! That's about it. We hope you enjoyed a look at some of the destinations we found interesting! Needing fresh water, we motored a mile out of Hope Town Harbor and anchored out in the Sea of Abaco. With our fresh water tanks getting low after five days in Hope Town, we came out to the clean water of the Sea of Abaco to anchor and run the watermaker. We enjoyed a nice lunch in the cockpit while hiding from a "fresh breeze" in the lee of the Parrot Cays, right outside the Hope Town Harbor. The generator is running fine now, thank goodness. A couple of days ago, the generator started sounding funny and I instantly discovered there was no seawater coming out of the exhaust so I immediately shut it down. After tracing the trouble down, I finally narrowed it down to the fact that no water was coming in through the through-hull valve; something was plugging it up, and despite the fact that the valve was open, only a dribble of seawater would come out of the hose end I unclamped. I tried blowing on the hose and could hear a few bubbles, but only at what felt like about 100 psi -- I guess I don’t have any weak blood vessels in my head because nothing popped! Finally, I managed to coax out the culprit: a whole, white plastic grocery bag from Vernon’s Grocery! Someone had let it go overboard and my generator sucked it up. Believe it or not, I was able to gently pull the bag, intact, through the 3/4 inch fitting, after which water rushed in as it should so as to feed the generator’s cooling system. I have never sucked up a plastic bag before in an engine intake and it is crazy that it happened out here where there is less "marina trash" than in the U.S. The good news is that I caught it so quickly that the generator and its rubber sea water-intake impeller never knew it happened and it is purring perfectly today! There is a Rage Sea condition on the outside right now! Huge waves are breaking on the beaches today, and the cuts and channels out into the Atlantic are closed out. To the north of where we are, we saw huge white crests coming in at the channel between Elbow Cay and Man-O-War Cay to the north. Also, all morning for miles to the northeast we saw what looked like huge geysers shooting up very high into the air as the Atlantic pounded the rocky portions of the Cays’ rugged outer shores. In the Sea of Abaco, where we anchored today while manufacturing fresh water, there were only one to two foot seas in the lee of the little Parrot Cays. The wind has been blowing 20 knots and better, which made it a little uncomfortable on deck for just hanging around. We have discovered an unconventional yet very handy “wind detector” on Indigo Moon. There is a big turnbuckle that tightens the rigging on the front crossbar of Indigo Moon. 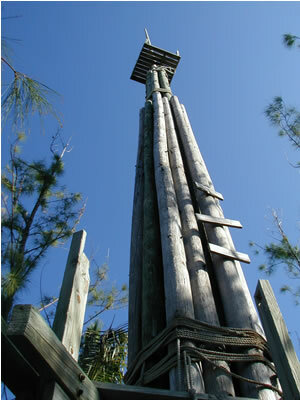 The turnbuckle has a slot underneath that starts to whistle when the wind blows hard. 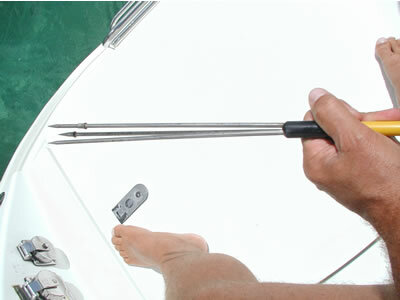 Just so happens, the point at which that turnbuckle starts to whistle marks a wind speed that makes it too rough in an unprotected anchorage and just plain uncomfortable on deck. So, even in the bunk and without looking outside, or without turning on any electronics or going on deck, we can just “listen for the whistle” to know what is happening with the wind. If Indigo Moon is whistling, then we know it will be time to find protection from the wind. She’s whistling steady today so we made one tank of water, pulled anchor and headed back into the Hope Town Harbor! 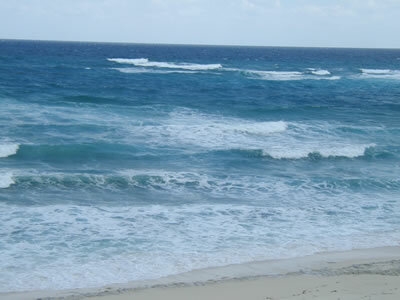 After getting Indigo Moon tied back to her mooring, we took the dinghy in and walked to the beach to see the Rage surf. It was awesome. Huge waves were coming in, with the brown coral heads and reefs popping up in the lows between waves. Offshore banks of bright-white cumulus clouds were building, lit by the afternoon sun behind us. Five miles offshore, a lone rain cloud of purples, blues and grays was pouring out a sheet of rain three miles wide that provided a nice contrast to the otherwise bright sunny skies. Melissa and I sat hand-in-hand on a bench at the top of a Hope Town dune and silently watched this wonderful panorama of nature for a long time before returning to the Moon for a quiet evening. It was a great day. Tomorrow, there will be a break in the weather. 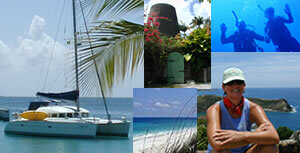 We will head out for a few days and explore some new areas to the south such as Little Harbor. Melissa is extremely interested in seeing the Pete Johnston Art Gallery there, founded by Randolph Johnston who settled there in the 1950's and was internationally renowned for lost wax castings in bronze. 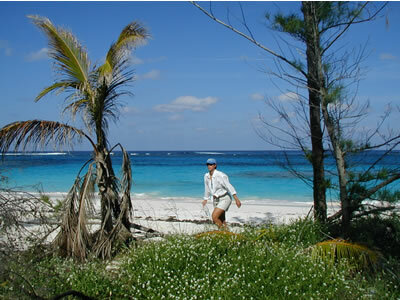 W hen our guests leave at the end of April, we will more than likely head south for a quick tour through the Exumas and Berry's in the Bahamas. Depending on how long we decide to stay in the Bahamas, we would still like to spend some time in the Florida Keys before heading up the East Coast for Hurricane season. We will be out of contact for a good while after this report is published, so please be patient with us in that our responses to your wonderful e-mails and phone messages will surely be dilatory at best.